Sometimes the off-season is a great time to connect with your team and try out some new and different exercises and conditioning techniques. Most of our blog content focuses on bleacher maintenance and stadium seating, but today we're taking a break from the norm and sharing some tumbling mat exercises that your team—whether softball, volleyball, lacrosse or cheerleading—might enjoy. 1. Bicycle crunches- This challenging Ab workout can be done at any time. The comfort of a tumbling mat helps keep the spine and tailbone comfortable so the focus can be on the burn instead of the pain. 2. Hollow Hold- This intense core work is sometimes difficult for those who feel it too much in their back our tailbone. A mat can provide the opportunity to benefit from this challenging pose. Raising the arms over head will be a sure way to get your team sweating! 3.Forearm plank- This is a great option for those with sensitive wrists as opposed to the standard plank. It works well on a mat because there is cushion between the arm bones and the hard flooring. Forearm plank isolates shoulders and upper back. 4. Dolphin Pose- Similar to forearm plank, but with your hips in the air (Think of an upside down "V"). This may be a yoga inspired workout, but don't assume it's easy! This will isolate your shoulders for strength, builds flexibility in the hamstrings, and develop core muscles--A triple threat! Bonus: Alternate between forearm plank and dolphin for an upper body fire-up! 5.Hamstring Stretch- Lay on your back and use a towel to draw one leg in at a time. This pose helps keep the spine long and straight while still getting a deep stretch. 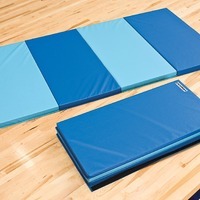 Versatile, and easy to store, a tumbling mat is a great asset for your team. We hope you enjoyed us switching things up this week, and good luck to your team next season!